10/15/2008Share this story on Facebook! Psychology students at IC are offered the opportunity to work with their professors for three semesters in the creation of original research. Ithaca students regularly present the results of their research at psychology conferences and have won awards for their work from the the New England Psychological Association, the New York State Psychological Association, the Eastern Colleges Science Conference, the Pace University Psychology Research Conference, and the Psi Chi Regional Award program. See another student talk about the research she conducted at Ithaca. When I was applying to colleges, the only thing I knew for certain was that I wanted to be an attorney. But one thing I didn’t know was what my major would be. As the oldest of six kids, two of whom have autism, I had dabbled in psychology in high school. I started thinking that having a background in the human mind would be useful for a future law career. I looked through all of the college information I had been receiving and eventually decided on Ithaca College. One thing that appealed to me about IC’s psychology curriculum was that all majors are required to participate on a research team for three semesters. Students are paired with a faculty adviser to conduct research of importance in various fields of psychology. Students may choose from several research projects: analyzing media data, evaluating educational programs, and studying infant language learning. I chose to study infant word learning under Professor Nancy Rader. I was extremely excited to take part in this hands-on research, which began in my junior year. The lab was the perfect, intimate setting for our team to discuss, analyze, calculate,and study. On our first day, Professor Rader made it clear to us that we were being entrusted with huge responsibilities, from keeping our infant participants safe to making sure we were present during reception hours, when we would serve as a liaison between our team and those interested in our research. That first semester was definitely a training semester. The team learned the research protocol and how to record and analyze data. We recruited infants for our study through word of mouth and by watching birth announcements and putting a call out on IC’s announcement website, Intercom. To study infant language learning we used digitally edited videos to introduce infants to objects that they would not have seen before entering our lab. This included toys -- Legos and a plush toy -- that were created for the purpose of the study. We created words for these toys that the infants had never heard. The videos featured separate trials for the infants to view; in some videos they would learn the word, and in others the infant’s comprehension of the word was tested. 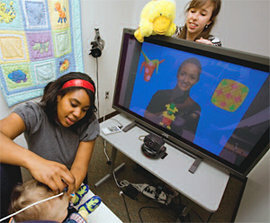 The next step involved using a gaze tracker to track infant eye movement. When the presenter in the video asked the infant to look at a certain object, we were able to follow the infant’s eye movement and see if he or she had come to associate the correct word and object pair. We also tested various hypotheses, including whether gestures would aid in word learning and what types of gestures led to more effective word learning. In our second semester, we had all of the same research responsibilities as before, plus we had to prepare to present our research at conferences. 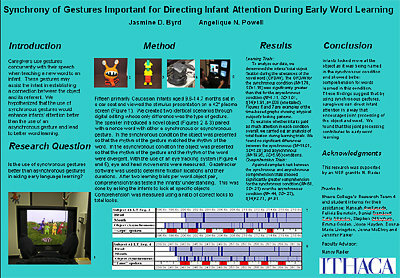 While this preparation took a lot of time, we continued to test infants in hopes that our results would support our hypothesis -- that a synchronous gesture (one in which the emphasis of the movement matches the emphasis of the gesture) aids infant word learning more than an asynchronous gesture (one in which the emphasis of the movement is different from that of the gesture) does. We worked around the clock putting together abstracts and posters to proudly summarize our research. Download a full-size PDF of this presentation at right. It was so rewarding to present our findings to our academic colleagues at Ithaca’s Whalen Symposium and at the Eastern Colleges Science Conference and the University of Scranton and explain what we had spent so much time and effort studying. Eventually most of us will have to make a major presentation in our professional lives, so this experience was practical, too. My team is graduating with practical knowledge you won’t necessarily find in undergraduate psychology programs at other colleges. The experience we gained will not only help us in our careers but will also make us attractive candidates to employers or when applying to graduate programs. We have a strong background in our field thanks to our department and this class. Looking back, I couldn’t be happier with my choice of a major. I have real work experience under my belt. I have worked with research subjects, analyzed data, and presented results. Before college and this experience, I never thought I wanted to practice anything but law and now I know that while I still intend to pursue my goal of being a human rights attorney, I could easily be passionate about a career in psychology. Infants looked more at the object as it was being named in the synchronous condition and showed better comprehension for words learned in this condition. These findings suggest that by using synchronous gestures, caregivers can direct infant attention in a way that encourages joint processing of the object and the word. We found that this joint processing contributes to early word learning.